I've been doing a bit of traveling this past month but I am happy to say I'm done until after baby is born. My last trip was to Fort Worth, Texas for a girls weekend. It was the very next weekend after we returned from our South Carolina trip and I wasn't exactly feeling up to another round of packing, putting the dog back into the kennel, early morning flights, and jet lag. But I know this kind of weekend will be rare or at least even more difficult to plan once our baby boy arrives so I was going to take full advantage of that "freedom" while I could. The 4am drive to the airport was made easier knowing that I was headed towards sunshine, blue skies, and 80 degree weather. Y'all, we've been drowning in the Pacific Northwest lately and I was in desperate need of some Vitamin D. I texted my friend beforehand to ask what the heck I should pack because I'd all but forgotten what warm weather feels like. Do I really not need a coat? I can bring sandals? Are you serious? As soon as I landed and was picked up by my friends, (Liz, our hostess for the weekend, and Jackie, who flew in from D.C.) we headed to the apartment to drop off my suitcase and release my feet from their sock prisons before heading out for lunch al fresco!! We went to the Rodeo Goat for delicious burgers. Mine had grilled peaches, bacon and tomato jam on it. I highly recommend it. And now I'm hungry again. After lunch we treated ourselves to manicures and strolled around the cute area near my friend's apartment. She lives in such a great location, close to a ton of shops and restaurants all within walking distance, which you can actually take advantage of because it doesn't rain all day every day... Seriously after just a few hours in the sun I was questioning everything I love about the Pacific Northwest and wondering why we don't live in Texas. That night we went to The Village Church's worship event. I have been a long time listener of Matt Chandler's sermons and even though 2 hours at church on our first night in town might not have been exactly what I had in mind it was still fun to get to hear him speak and to sing praise with my good friends. The next morning I slept in a bit while the other two crazies when for a run... just like when we were all roommates. Then we headed out to a "Shop Small Fort Worth" event and met up with one of Liz's sweet friends. It was an adorable pop up craft fair of sorts filled with cute booths from local boutiques and vendors. 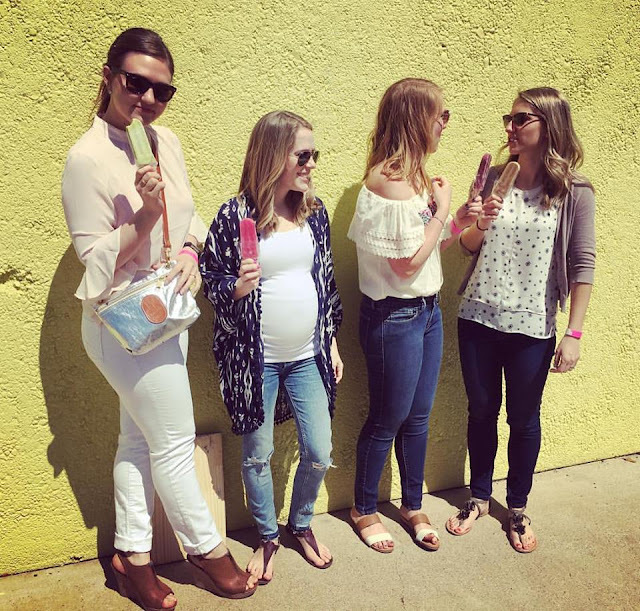 After I talked Liz out of buying a oversized wood cut out of the state of Texas to hang in her apartment... we grabbed popsicles as a sort of appetizer before heading to brunch. Brunch was again enjoyed outside in the sunshine at HG Sply Co situated alongside the river in Trinity Park and I actually had to apply sunscreen which I was only too happy to do. We were talked into vegan chips and queso which sounds like an abomination but I will admit it actually was surprisingly good. Our leisurely lunch was followed by more relaxation back at my friend's apartment complex pool. Y'all! Did you catch that? I laid out at the pool in March! The baby bump saw the sun! Hallelujah, praise the Lord! I am going to pause here to say that my dear friend Liz, born and raised in Maryland, though you wouldn't know it if you met her today, has officially drunk the Texas Kool-Aid. Seriously the mayor of Fort Worth should pay this one-woman welcome wagon a commission. She knew all the best spots and instagram shots that were not to be missed and she made sure we saw just how awesome Fort Worth is. So after soaking in some Vitamin D, we headed back out to check out a new local bar that was just opening called American Gardens. Basically it was a big outdoor patio with picnic tables, string lights, yard games, and just a fun spot to hang out with friends. We came back home that night and all changed into matching pj's for some chill time on the couch. The matching pj's is an adopted girl's weekend tradition started last year when they came out to Washington to visit me. I'm hoping we carry this tradition well into old age, along with the tradition of staying up late into the night and talking about life and how much it's changed since we all lived together, for better or worse. The next day we went to church together and then out for BBQ and ice cream. The perfect Sunday morning. Liz had a bunch of Fort Worth-y activities on our itinerary and kept saying we needed to "do the stockyards," whatever that means, but I managed to convince her that going back to the pool for the afternoon was actually a much better idea. And since this might very well be the only weekend I get to wear a bathing suit all year I was beyond thrilled that she agreed. That night we got dressed up a bit and went to Sundance Square, yet another adorable part of Fort Worth, with tons of restaurants, fun outdoor seating, and a fountain all lit up. We met up with another one of my friends from college for Mexican food which we of course enjoyed outside again. When in Texas. It was a perfect last evening out in Fort Worth before our last morning in town. But before our flights out the next day we managed to finally "do the Stockyards" which included wandering around the very historic Texas/ Old West part of town where we drooled over custom leather cowboy boots before stopping for one last selfie. This girl's weekend looked a lot different from their visit out to the PNW last year- the sunshine being just one part of that. I love that even though a year may pass between visits, being with these girls still feels like being roommates again and all the entails. Friends for a lifetime - such a blessing!! Every time I see someone's photos from a trip to Texas, they look like they're having so much fun and going to so many cool places! This looks fantastic!